If you ever visit our offices at Forms Plus, you will notice immediately that Workplace Health is high up on our agenda. You’ll see fruit rather than cakes (most of the time! ), water bottles on everyone’s desk, pedometers or fitness trackers on our wrists and you’ll hear reminders for team walks and daily afternoon stretches. 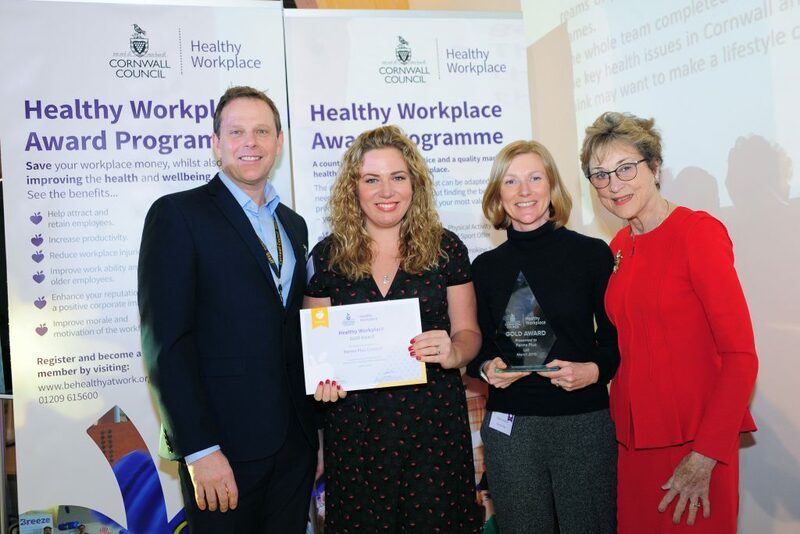 We are delighted to say that this year, after three years of working our way up through the Bronze and Silver Categories, we have been awarded the much-coveted Gold Award in Cornwall Council’s Healthy Workplace Scheme. You can read more about what the Award means and how we achieved it on the Be Healthy At Work website. Clare Hughes, our Print Coordinator and a keen runner, has led the project. Alongside the management team, Clare’s work on pushing the healthy living ideas forward has helped keep everyone at Forms Plus motivated, happy, healthy and working together. 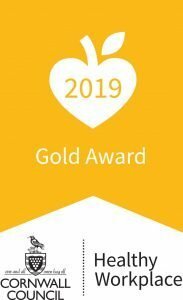 I am really pleased that Forms Plus has been able to secure the Gold award this year. The company has invested a lot of time and effort into ensuring that the office is more than just a workplace. The team themselves have also contributed and supported the ideas and activities that came out of our ‘Health Plus’ programme, so it’s been a real team effort. Clare, Jo and Sharon are clearly very passionate and motivated and their commitment to this area of work has been instrumental together with the team of other staff members whom all lead on certain health areas and contribute throughout the year. We were extremely impressed with the close bond of the workforce demonstrating a caring and supportive environment to work in. With most of us in sedentary roles, behind a screen all day, it can be easy to slip into bad habits. The Healthy Workplace Scheme initiatives really have inspired the whole team to make our time at work healthier. If you are interested in improving your workplace health, there are lots of ideas in our How to Stay Healthy in a Desk Job blogs or get in touch and we’d be happy to share ideas. « What is double-side thermal printing?